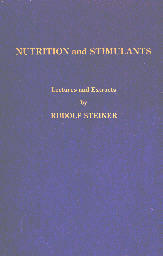 This book contains extracts from Steiner's lectures and writings that range from one page to fourteen pages long and cover the period from 1905 to 1925 on the subject of nutrition and stimulants. In this 230 page book, one can find in one place all the important things that Steiner had to say on nutrition, food intake, how various food stuffs affect the etheric, astral, and Ego bodies, what foods affect the various organs of the body, and how anthroposophy's view of the care and feeding of the human body differs from materialistic scientists. If the "education as a bank metaphor"(1) has proven inadequate to describe the function of teaching, then equally inadequate is the "nutrition as a bank metaphor" to describe the process of nutrition in the human being. Is it not the prevalent metaphor or scientific paradigm to believe that the chemical constituents of the food that goes into one's body are the most essential thing to one's health. Put in good materials products, however derived, and you will be healthy. "Don't want the bother of nursing your baby? Give it a baby formula. It's just as good!" — that's the message of the current paradigm. Perhaps there are things going on in your body that science knows nothing about because it only addresses the material content of the food and not the spiritual nature of the plant and animal food that you ingest and how your body reacts differently to each kind of food. If you believe that current paradigm is the best of all possible worlds, perhaps this book is not for you. If you are concerned with eating healthy, perhaps this book is for you. Babies need milk. It is a living fluid as it comes from its mother's breast and it provides all the nutrients that the baby needs to grow, plus it contains a lot of fluid that is necessary for building up the baby body. We all have bodies that are 90% water, and babies are no different. Since their bodies almost double in size in a couple of months, they need food that contains a high percentage of water to help them to increase their body size. A baby tastes with its body and, when drinking its mother's milk, will feel an incredible sweetness that pervades its entire body. This process of tasting with its body only wanes after it has been weaned. [page 8] Milk is fundamentally still alive when the child drinks it. It is almost liquid life that the child imbibes. [page 12] Before it was born it was part of the body that produces its milk. So the child feels connected with milk. Therefore milk does not produce a bad taste for it. If the small child gets other food too soon it will find it nauseating. This does not apply to the adult, because his taste has become coarser. But the child finds it nauseating because he is not related to foods from the outside. [page 188] The grown-up wants change. The baby gets no change, few people can imagine the joy a baby gets out of this food. The whole body becomes saturated with intense sweetness from the mother's milk. The grown-up person only tastes with his palate and neighboring organs. He has the bad luck that all the sensations of taste are concentrated in the region of the unfortunate head. This distinguishes him from the child which, as a baby, is through and through an organ of taste. When the baby is weaned this comes to an end. In this book, Steiner talks a lot about alcohol drinking and a lot about meat eating, but he doesn't tell anyone to avoid drinking alcohol or stop eating meat. Here's a very clear statement of his position on this matter. [page 35] What one can learn about alcohol can be understood by everyone. And now we come to what I always say. People come and ask: Is it better not to drink alcohol or to drink alcohol? Is it better to be a vegetarian or to eat meat? I never tell anyone whether he should give up alcohol or drink it, whether he should eat plants or meat. I say to people: Alcohol does so and so. I simply explain its effect, and then they may decide whether to drink or not. I do the same with regard to vegetarian or meat diet: Meat does this and plants do that. And the result is that they can decide for themselves. Too often, and once should be one time too many, I have heard anthroposophically inclined folks telling others that they shouldn't eat meat or drink alcohol. I suspect these are folks who have a strong case of what I call "neophyte fever" — they have gotten the message and they wish spread it around to everyone who will listen. Messages of this sort tend to have the opposite effect than the one intended. Steiner's view is much more in keeping the principles of freedom — allow human beings in freedom to decide what course is right for themselves. Coffee is the beverage of choice for the journalist or writer and tea the preferred beverage of the diplomat. Why is that? Listen to Steiner talk about a journalist who has to write an article a day, which he says uses up a lot of "brain sand." Steiner goes on to say that while coffee can help one person concentrate on a coherent line of thought, another person may wish to appear witty and clever and be a good conversationalist. For that person tea is the beverage of choice. [page 6] A person who does not want his thoughts to be concentrated but wants them to sparkle and scintillate, who likes to throw off witty remarks which appear clever — he drinks tea. It has the opposite effect. It scatters thoughts. If I were to tell you that people have given up interest in spiritual matters, they work in a job they don't like, but which brings in money, and that few people read a book that requires an effort on their part to understand it, you would think that I was probably accurately describing a majority of people today. And yet, my words are merely a paraphrase of what Steiner said on page 23, words he spoke almost eighty years ago. He saw then those who constantly avoided understanding things were letting their blood become thick and they found that smoking a cigarette would get their blood moving again. But the faster pulse when smoking is not accompanied by a higher respiration rate and thus one has a slight shortness of breath and a subtle anxiety that are always present. [page 39] The deeper causes of illness are just such very slight fears which remain unnoticed. [page 41] When you read the papers or go out to the theatre it stimulates the senses and the intellect but does not stir the blood. If however one sits down to read a difficult book, the blood is stimulated. As soon as one has to make an effort to understand something the blood is stimulated. But this is what people do not like any more. They not want to have to exert themselves to understand something. This goes against the grain. They do not want to understand anything. And through not wanting to understand, their blood becomes thick. The thick blood moves slower and the result is that they always need a remedy to get this ever thickening blood moving. It gets moving when they put that glowing weed — the stick of nicotine — in their mouths. But even then it does not get any thinner and the circulation becomes more and more difficult. The result can be that signs of ageing appear earlier than need be. There may be some of you who wonder if Steiner has ever been put to the test. Has anything he predicted would happen actually happened in the world? Well, there are many, but just to name one that has been in the news for a few years in the continent of Europe, Bovine spongiform encephalopathy, BSE, or what's commonly known as "mad cow disease". The internet tells me that "BSE was first diagnosed in UK cattle in 1986." Scientists have in recent years traced the origin of BSE to the addition of animal meat and bone meal mixed in cattle feed. The cattle farmers could saved themselves a lot of trouble if they had only read and heeded the words Rudolf Steiner spoke in 1923. He pointed out that if a cow suddenly began to eat meat, "all the forces which could produce meat are left idle." He likened this to a factory that is running full speed but producing nothing. 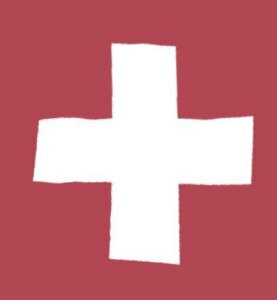 In the cow all sorts of waste products and harmful substances would be produced, mainly uric acids and its salts. [page 45] Now these salts of uric acid have their own special habits. They have a liking for the nervous system and the brain. And if the cow were to eat meat, enormous quantities of uric acid salts would be deposited; they would go to the brain and the cow would become deranged. If we could make the experiment of suddenly feeding a herd of cows on pigeons, the result would be a completely mad herd. Horses become wild immediately if given even a small amount of meat to eat. Steiner pointed out that the eastern part of Asia which is mostly vegetarian rarely goes to war, but the western portion, mostly meat-eaters, often have had raging wars. What is different about meat-eaters and vegetarians in the animal kingdom? The carnivores, like lions and tigers, have very short intestines, whereas the herbivores have very long intestines. [page 46] So it is with man. If he is born into a people or race where all his forefathers have eaten meat, he will have a shorter intestine. It will have become shorter, too short for a pure vegetarian. And then he will have to do everything he can to maintain his health if he eats only plants. [page 46] One does not tire so quickly. From within the organism one does not get so tired because one does not deposit all this uric acid and its salts. One does not tire so quickly and keeps a clearer head and can therefore think more easily, that is, if one thinks at all. On the subject of diabetes, Steiner has a lot to say. Sugar is important to the proper functioning of our body — we need it — but when an imbalance occurs and it is excreted in the urine, the condition known as diabetes occurs. Here Steiner gets into how various races deal with sugar and the effects it has on their bodies. First the English and the Russians, and then the Jews. Do these racial distinctions make sense to you? Read on. [page 47] Sugar is the substance which inwardly supports us if it is rightly conveyed into the body. This can even be established statistically. In Russia there is far less sugar eaten than in England and this is what makes just the difference between the Russian and English races. The English have self-awareness and are egoistic; the Russians are a little weak, not egoistic, but weak. If the above generalization does make sense for you, perhaps you have seen movies about alien beings such as "Starman", "Men in Black", "Michael", and "The Coneheads" in which the aliens show an excessive use of sugar, pouring heaping quantities in cereal bowls and coffee cups and then consuming it immediately. This quirky behavior is actually a deep insight into very human processes of the Ego having to do with the use of sugar. In each of the movies, the alien ingesting huge quantities of sugar had a very strong and definite personality indicating a strong Ego. [page 168] In countries where, statistically, little sugar is eaten, the people have a less defined personality than in countries where more sugar is eaten. Has the appetite for sugar in Russia increased since Steiner's time? Likely so. With modernization, westernization, and mechanization, the intake of sugar seems to increase. I had often wondered about the purpose of Kosher rules for the Jewish handling of food. This is the first description I have read of why and it makes a lot of sense to me. [page 47, 48] The [Jewish] race has a tendency towards diabetes. Jews have a certain difficulty in assimilating sugar, on the other hand they need it. Therefore the Jewish diet should be such that it helps the body as much as possible to make use of sugar and not excrete it right away. . . . Above all the eating of pork was forbidden in order to prevent diabetes, since pig meat makes the proper utilisation of sugar particularly difficult for man. . . . Even the Jewish method of slaughter, for instance the way of killing poultry or other animals, is calculated to leave the correct amount of blood in the meat which the Jew eats, for the proper utilisation of sugar. By now you must suspect that those who eat a lot meat during the year have some excess substances built up in their body and what do they do? They go to a spa. Steiner tells us on one of the benefits of a spa with its mineral water. [page 48] So they go to Carlsbad. You know how Carlsbad water works. It produces quite a nice little diarrhoea. So they have a good clear out and when they go back they can start again. But as a rule, all that happens is that they have to return to Carlsbad the following year. And if they are once prevented from going to a spa they readily get diabetes or something like it. To help me as I studied this next chapter, I drew a diagram which I would like to share with you. There is a curious and important rotation that goes on as we advance from the plant kingdom to the human kingdom which is best explained by noticing the location of the sexual organs in each kingdom. The flowers reaching for the Sun are the sexual organs of the vertically oriented plant and are generally near the top of the plant. In animals, there is a ninety degree rotation: their bodies are horizontal and their sexual organs at a level with their torso. In human beings, our bodies are vertical and our sexual organs are at the lower extreme of our torso. In a sense, humans and plants are the inverse of each other. That inverse relationship is shown in the diagram at right, and some of the words placed on the diagram will be useful mnemonics for recalling how various plant parts affect the human body. Right away you can see that the human head corresponds to the roots of the plant. Any root crop will be important to the head of the human being. Potatoes, while often considered to be a root crop are really not roots per se, but rather may be thought of as "thickened stems" of the potato plant extending below the ground. If you dig up potatoes, you'll notice that the real roots grow out from the tubers which are right below the surface of the soil. Thus potatoes affect the lower portion of the human head, the jaw and gullet. Steiner points out that this is why potatoes can be so tasty — the region of the jaw is where the potatoes are chewed and tasted. The real root crops like beets, carrots, radishes, turnips, etc, work on the entire human head. Fruits, which include beans, lentils, peas, rye, wheat, and rice work on the head. The leaves work on the lungs. Seeds on the heart. Tomatoes on the liver. Flowers on the kidneys. These relationships are shown on the second diagram. [page 57] If one eats beetroot, one becomes filled with a desire to think. This is quite conscious. If one eats potatoes, one only desires to eat again soon. As soon as I read about beets, I recalled how much I liked beets as a child. I didn't like liver, so my mother would give me beets saying if I would not eat liver, beets were just as good for my blood. She was not an anthroposophist, so I suppose she thought that both liver and beets were good for my blood because they looked like blood. Now after all these years, I discover that beets are brain food. I still like them a lot and endeavor to eat them during the full moon especially when they will get rid of any worms I might have in my intestines. Next to beets, radishes are one of my favorite vegetables. Radishes have lots of natural salts, which go directly to the brain and stimulate one's thoughts. On the other hand, I have never cared much for potatoes. Mostly we ate our food with rice instead of potatoes growing up. In this next passage, one can conjure up the popular image of the "couch potato" who goes to sleep in front of a television set each night after a large dinner of meat and potatoes and a late night snack of potato chips. [page 57] People who eat lots of potatoes do not get strong thoughts, but they get heavy dreams. If somebody has to eat potatoes all the time, he will be actually a bit tired all the time, and will always want to sleep and dream. Therefore the food that man actually receives has an important bearing on the history of civilization. In this next passage Steiner tells us of another of the effects of potato eating: people become more receptive to new ideas, but at a superficial level. Does this sound like any number of talk shows you've encountered in the various media? All kinds of new ideas dealt with at a superficial level, while their tv commercial blares out, "How about a bag of the new crispy FDA-approved, Fat-Free, Superficiality Chips?" Here's Steiner's exact words for you to ponder. [page 196] Potatoes, at a certain time, began to play a particular role in the development of European humanity. If you compare the increasing use of the potato with the curve of the development of intelligence, you will find that in comparison with today, people in the pre-potato era grasped things less quickly and readily, but what they grasped they really knew. Their nature was more conservative, profound, and reflective. After the introduction of the potato people became quicker in taking up ideas, but what they took in was not retained, it did not sink in deeply. The history of the development of the intelligence runs parallel with that of potato-eating. If the bank deposit metaphor of nutrition were true, then a person who got the proper amount of salts via diet should never become dim-witted, and yet it happens that some of those salts never make it to the brain, because they are contained in foodstuffs that get deposited inthe stomach and intestines. [page 61] If a person is so ill that all the salt in his food is deposited in the stomach and intestines and not carried by the blood into the brain, he becomes feeble-minded and dull-witted. This is an important point. In carbohydrates, Steiner makes the point that they are largely responsible for our human form. "Carbohydrates," he said, "outline the shape of our body." (page 62) Again if one eats carbohydrates, and if these do not reach the brain, it is his human form that suffers. [page 62] If man, through his constitution, is unable to direct the carbohydrates to his brain, if they are deposited in the intestines and stomach instead, then he fades away. One sees how he collapses, becomes weak, and how, to a certain extent, he can no longer maintain his form. Next he discusses fats. When we are awake and moving, fats lubricate the human body; when we are asleep, they are deposited in the body. Someone who eats a lot and sleeps a lot gets a pot belly. If a person does not get enough fats, they waste away. When they eat lentils, beans, peas, rice, rye, and wheat they get carbohydrates from fruit, rightly understood. [page 65] Fruits have the peculiarity that they are digested in the stomach and intestines and only send their forces up to the head. So when you eat wheat, lentils and beans, they are digested in the intestines, as you know from the characteristic discomforts which can arise when you eat lentils or bean. The main characteristic of fruits is that they are thoroughly digested in the intestines. But, interestingly, potatoes are not thoroughly digested in the intestines, but are carried by the blood to the brain to be digested, and this digestive load on the brain makes it difficult for one to think. Thus the increased consumption by Europeans and their descendants in America has caused us to lose capacity to think with the middle portion of the brain. Luckily, the frontal part of our brain gets nourishment from salts and is able to think quite well; unluckily, real spiritual thoughts cannot be thought by the frontal brain. The result has been a movement toward materialistic thinking in Steiner's time and our time. [paraphrased from page 66]. [page 66] It is a fact that inner thinking in Europe regressed from the moment that the potato took hold. Let's take another look at the second diagram above and note in particular the four bodies and the foodstuffs associated with them: Physical — proteins; Etheric — fats; Astral — carbohydrates; Ego — salts and sugar. Materialistic science knows nothing of those four bodies and is therefore unable to make use of the knowledge that Steiner makes available to all of us in these excerpts from his lectures on nutrition and stimulants. [page 67, 68] What does science do? It analyses protein to see how much carbon, oxygen, nitrogen, hydrogen, sulphur, etc. are in it. It finds there is so much per cent of carbon and so much per cent of hydrogen in protein. Fat contains a different percentage and carbohydrates are again different. But science is completely ignorant of the fact that these substances themselves have their own significance. Science only knows the percentages of the constituents. But this does not help us get anywhere. Today we might add a whole laundry list of new percentages that science has elaborated for us: percentage of fat to body weight, percentage of good cholesterol to bad, percentage of fats to calories consumed, ad nauseam. They tell us to use these percentages to vary our diet, but since they make no distinction between the types foodstuffs carrying the carbohydrates, we find ourselves in a fast food culture that consumes enormous amounts of french fried potatoes and is becoming, just as fast: fatter and fatter, dumber and dumber. [page 68] The constituents of the potato are present in it in quite a different way from what they are in rye and wheat, and one must know that if one eats a flower or a fruit it will be digested in the intestines, while if one eats a root it will be worked on in the head. The same thing applies when they are used medicinally. If one can understand them according to a true medical science, one knows that a tea or infusion of flowers, seeds or fruit works predominantly in the intestines. If ones make a decoction of the root, it has a healing influence on the head. Look again at the second diagram and notice that the physical body is mainly protein. Eggs contain mostly protein and when they lose their etheric body with in their shells, they rot and begin to smell the typical rotten eggs smell. A similar thing happens if we ingest too much protein and the smell becomes present in flatulence. At death, the etheric body withdraws, whether from an egg or a human body, and the material held with in the physical body, mainly protein, begins to rot. Before death it is the job of the etheric body to maintain the protein in a living condition to prevent it from rotting. Going up the body we next come to the astral body and its job is to prevent the fats from spoiling or becoming rancid (fats do not rot). Rancid fats are easily perceptible to taste, as rotting protein is easily accessible to smell. There are smells associated with rotting protein if the etheric body is unable to cope with excess protein. Similarly if the astral body is unable to cope with the excess fat, then one can perceive it as a bad taste in one's mouth. [page 78] This unpleasant taste reflects back on the stomach. In this roundabout way man gets gastric and intestinal illnesses from rancid fat within him. For a person who is inwardly rancid, because he has in him too many fats that he cannot transform, arsenic is a good remedy. Arsenic [homoeopathically] combats the accumulation of fat, it strengthens the astral body. When George W. Bush became president of the USA, he was ridiculed in the press and by liberals in Congress for relaxing the newly created strenuous requirements for removing arsenic from the environment, requirements that were so exacting that the cost to US businesses would be onerous. Someone might make a study and find that the more relaxed arsenic levels provide a homoeopathic arsenic level that would actually be beneficial to humankind. Here is another example of the folly that passes for materialistic science, where a poison is considered to be a poison in any concentration and therefore dangerous and to be completely eliminated, no matter what the cost in dollars to humankind. If one wishes to understand how poisons are concentrates of the spiritual world that are extremely helpful in minute quantities, one can read Steiner's collection of lectures on Bees, or my review of same. Everyone knows that alcohol is used to preserve tissue specimens ( alcohol keeps flesh from rotting) in laboratories. The flesh within our body would rot were it not for the alcohol that is constantly generated within from our food and circulated in our body. "Wow," some beer drinker may be thinking, "I'm well-preserved for sure!" Unfortunately, drinking alcohol, ingesting it as a food, causes a problem for our body. Our head's job is to oppose the natural tendency of starches and sugars to ferment. "When you drink alcohol it drives out of your head the forces that would prevent the fermentation of sugar and starch." (page 80) As a result we become full of the forces of fermentation when we drink alcohol. And the next day we awake with a painful reminder of where the problem with excess fermentation occurred - in our head, heavy with a hangover. Think of the tv commercials which involve a bunch of guys watching a football game, drinking beer, and eating potatoes. These two in combination: potatoes and beer have a particularly deleterious effect on the middle part of the brain. The brain has to work hard to prevent the starch from the potatoes from fermenting before it is turned to sugar and the sugar from fermenting afterward. As if this weren't enough, the forces of the head that are able to prevent fermentation of starch and sugars are immobilized by the alcohol contained in the beer. The effects of this on society cannot be over emphasized. Fast food can lead to dumb kids and overweight materialists. Plus there is a form of positive feedback that occurs in the process of eating potatoes that amplifies the possibility for damage. Negative feedback is a signal to change the output signal in the opposite direction of an input signal. The temperature goes up and the Air Conditioner comes on to lower it. Positive feedback is dangerous because when the input signal increases, a signal is sent to increase it even more. E. g., when an electric motor loses insulation due to heating up, minor short circuits occur which cause the motor to heat up even more. This continues until the motor "burns up." Here's how the deleterious positive feedback occurs in potato eaters. Potatoes activate the tongue and the gullet and produce a delightful sensation and causes the person to want to eat more. As the Lay's Potato Chip commercial goes, "You can't eat just one." Over time, the excessive eating of potatoes causes the mid-brain where the senses are mediated to deteriorate. The result is that one loses the very signal of when one has had enough to eat! One can imagine the result. [page 83] Supposing someone eats too many potatoes as a child. In later life one will find that such a person does not know when he has had enough because his sense of taste is spoiled by potato eating, while a person who has not eaten too many potatoes knows by instinct when he has had enough. Eighty years ago Steiner wrote on page 88, "When it comes to the point that mankind only remains reasonable or even useful when everything is prescribed by law, then really mankind on earth is no longer worth much." There are times when I think we have already reached that point today. Each year brings new laws governing what we can or cannot do. We cannot drive with just a seat belt and an operational airbag without getting pulled over and ticketed for not having our shoulder strap lashed tightly across our chest. I know. I got such a ticket. No amount of reasoning or logic seemed to satisfy the officer who was only trying to "protect me." From what? The lap belt keeps me in the car and the airbag keeps me from hitting the steering wheel. You buy a hammer and it's got a warning label on it. You buy a can of spray and the label reads, "It is a Violation of Federal Law to Use except in Accordance with Directions." With so many Federal laws they even put a member of the House of Representatives in jail for doing the same things that a Senator got a limp slap on the wrist for doing. With so many laws the forces of coercion can basically do whatever they want, even in the USA, a country that prides itself on being the freest country in the world. With so much doublespeak around, I would have to agree with Steiner that "mankind on earth is no longer worth much." Morphine is an alkaloid opium extract and is still the drug of choice in cases of intractable pain. As such the comments that Steiner makes about opium usage undoubtedly applies to morphine usage as well. [page 93] People say casually — you will have heard this — sleep is sweet. As regards sleep man cannot feel this sweetness because he is asleep. He cannot feel it, he can only have a foretaste of it, and because he has this anticipation people say: sleep is sweet. But when man takes this poppy juice — opium — he feels this sweetness because the connection with his body is the same as if he were asleep, but he is awake. Therefore he can enjoy this sweetness, he can feel it and it fills him with great pleasure. It is as if his whole body was saturated with sugar, with a quite special sugar, full and full of sweetness. But at the same time his astral body is freed from the physical body, and consequently he perceives all kinds of things but not distinctly. He does not have ordinary dreams but perceives the spiritual world. He goes on long journeys through the spiritual world. He likes this. He is lifted up, as you said, lifted up into the spiritual world. [page 114] If we use mineral fertilizers it is like putting salts into the soil, only the root becomes strong. We only get from the plant what forms and maintains our bones. We do not get a proper protein. This is why our crops suffer from protein deficiency, and it will become more and more so if people do not revert to proper manuring. An interesting question was asked by someone about his father, who had restricted activity at 70, but at the age of 85 had a better health than earlier. Steiner picked up that the questioner had hay fever and pointed out that if his father also had hay fever, that it's unlikely his father had arterial sclerosis as the two are the opposite of each other. [page 118] "You suffer from hay fever. Your hay fever is something like a safety valve against sclerosis." In the short excerpt entitled "Nutrition from the Air" Steiner points out that we take in nutrition from the air we breathe, from the minute particles that reach our lungs as we breathe. He also adds that if it were not for the nutrients we receive in the air we breathe, we would have to renew our bodies in shorter than the normal seven years during every cell of our body is replaced by a new one. [page 126] We do not only live by what we eat but also by the finely dispersed substances in the air we breathe in. Sometime back I made the statement that Steiner never used the word "must" and several people took issue with me. Well, they've got me now. Clearly he used the word "must" as a verb of obligation is this next passage. If you read this passage carefully you will note as I did that Steiner is arguing for freedom for the individual, the right to freely choose once given the truth. With his first "must" he is exhorting his listeners to not misunderstand his purpose and intentions, namely to offer the truth and allow people to freely choose for themselves. [page 140] We must understand each other precisely as to the purpose of today's lecture and the intention behind it. We are not agitating in favour of particular tendencies, nor are we trying to be reformative. The spiritual scientist is obliged to state the truth of things. His attitude must never be agitatorial, and he must be confident that when a person has perceived the truth of what he says, he will then proceed to do the right thing. A vegetarian came recently to lecture to a club I belong to. After the speech, the president asked me what I thought about the man's talk. I said, "There wasn't much meat to it." That idiom means that the talk in question had little substance — it is the kind of idiom one would expect in a primarily meat-eating society such as the one I grew up into. This man was trying openly to proselytize his audience into becoming vegetarians by installing fears and phobias in us as he detailed the horrors that we were supposedly doing to our bodies by eating meat, eggs, and milk. His half-truths had the luster of non-truths about them. If everyone in that audience had suddenly taken this man's advice and turned into vegetarians, they would have done untold damage to their bodies and their social lives. [page 199] The more we are compelled or advised to have some extra kind of food -- or altogether anything special — the more unsocial we become. The significance of the Last Supper is that Christ gave the same to all of his disciples and not something special to each one. Making it possible to be together as human beings when eating or drinking has a great social significance, and anything that might tend to repress this healthy tendency should be treated with some caution. Here was a man who was completely violating the "musts" Steiner so wisely laid out above for us. The club speaker's attitude was agitatorial and he was openly trying to reform the people in the room for what he openly but mistakenly thought was "their own good." He was urging us to become vegetarians out of a purely abstract principle and pressing our fear buttons to convince that we had better do it or else! To install phobias and fears in people is a sub-human thing to do versus the truly human thing which is to share the truth of the matter and allow others to decide for themselves. 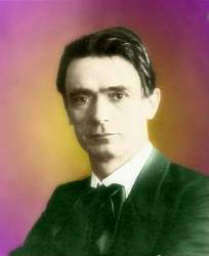 Once more, Rudolf Steiner sets a marvelous tone and example for us in this passage. The tomato had recently been introduced into the diet of the world in Steiner's time, and he made a point to say two very important things about the tomato. First, he says the tomato is an independent force in the body and can counteract liver ailments. Second, because of its independent nature, the eating of tomatoes should cease as soon as one discovers one has a cancerous tumor, which also has an independent nature. [page 180] Two things follow from this. First, it confirms the statement of an American to the effect that tomatoes, under certain circumstances, have a most beneficial effect on a morbid tendency of the liver, because the liver is the organ that works with the greatest relative independence in the human body. So that, generally speaking, disorders of the liver could be counteracted by tomatoes. In parenthesis, I may add that a person who has a carcinoma should at once be forbidden to eat tomatoes because carcinoma is itself something that has made it self independent within the human or animal organism. Fat chance I would let this next quote slip past me. In other places I've read where Steiner said that fat is one food substance that creates the least difficulty for the body and provides the quickest energy when we are hungry. Every where I look these days I see the following interesting paradox: fat people eating fat-free foods. Since they are obviously eating too much food, doesn't it ever occur to them that it's the volume of the food they're eating that is the problem, not the substances called fats? Perhaps if they ate a smaller quantity of food containing normal amounts of fat their bodies would be satisfied and they would attain a more suitable weight and size. I really get tickled when I see labels like Fat-free on food that obviously never contained fat. Fats are readily absorbed into the human and we do best when we keep a balance of them in our diet. [page 205] Of all the substances taken into the organism from the outside, fat behaves least of all as a foreign substance. More readily than any other substance it passes from its own nature to that of the human organism. The 80% of fat contained for instance in butter passes unchanged by ptyalin and pepsin and is only transformed by the pancreatic juice into glycerine and fatty acids. This behavior of fat is made possible because it carries as little as possible of the nature of a foreign organism (i. e. its etheric forces etc.) into the human organism. The latter can easily absorb it into its own activity. This next passage will be a stretch for some of you not familiar with Rudolf Steiner's exposition of the evolution of our Earth. Those of you who are more familiar with Genesis than with astronomy will be more comfortable with Steiner's view on many points. We are currently living in the fifth post-Atlantean Epoch. The first epoch began about 8,000 B. C., the time of the Great Flood at the end of the Atlantean Epoch. Preceding the Atlantean Epoch was the Lemurian Epoch. Humans were rather strange creatures during that long pre-historical time, their bodies could stretch like that of the famous comic book character, Plastic Man. Our bodies had not yet reached the hardness that we currently experience today. It is this time period that Steiner is talking about, when humans lived off their environment as babies in the womb today live off their mother. During the Hyperborean Epoch preceding the Lemurian Epoch, the Sun separated from the Earth, and the plants left behind on the Earth reached for the Sun in the sky. [page 208] There was a time when human beings were able to draw nourishment from their immediate environment, just as our lungs draw air today. Man was formerly connected with the whole surrounding nature by 'suction-threads' and nourished in a somewhat similar way as the human embryo is in the mother's womb today . . . . The process of suckling in mammals is the relic of it. Milk is like the food taken by man in pre-Lemurian times. It is the old food of the gods — the first form of nourishment on earth . . . When the sun separated from the earth the plants . . . turned their flowers towards the sun. The part of the plant which grows above the surface of the earth is related to the sun as milk is related to the moon. A kind of plant-food, consisting of the upper parts of plants gradually replaced milk. This was the second kind of human food. [page 210] After our present 5th culture-epoch has come to an end, then, in hte 6th culture-epoch, the meaning of the Eucharist will be understood. There will then be no eating of meat. Between now and then, it will become possible to develop the third form of nourishment, purely mineral nourishment. Man will then be able to create his food himself. First of all he consumed what the gods prepared for him; later on he will advance and will himself prepare in the laboratory the food he needs . . . In the same measure in which he produces his own food out of his own wisdom — the god within — he advances toward his own deification . . . Man will gradually create life for himself out of the mineral world. What the scientist knows today is only a fraction of the great cycle. This is a great compilation and should be a part of everyone's Steiner library. 1. The term "bank deposit" refers to treating education as material that must be deposited by the teacher into the student's mind for later retrieval such as on a LEAP or SAT or GSAT test. Modern materialistic science and popular opinion is that nutrition works on a similar basis. You deposit some chemicals into your body and your body uses them to build itself and keep it healthy. Just as "bank deposit" teachers neglect the living processes that go on inside their students that add up to what we call real education, so also do "bank deposit" nutritionists neglect the living processes within the living food that people eat that add to what we call real health.